Properties in Chiclana de la Frontera average 4.5 out of 5 stars. Property with two apartments for two people each. Property 2: Property with two apartments for two people each. Rural bungalow 4 for people. Property 7: Rural bungalow 4 for people. Cabañas de Verón. Among the pine forests of the dehesa de Roche. Property 16: Cabañas de Verón. Among the pine forests of the dehesa de Roche. Casita Chau, Stylish 1 bedroom wooden house. 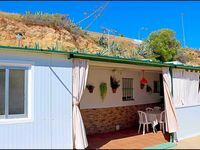 Property 25: Casita Chau, Stylish 1 bedroom wooden house. House for a relaxing holiday, pool and good weather. Property 31: House for a relaxing holiday, pool and good weather. Beautiful one bedroom eco cottage in the countryside with shared pool. 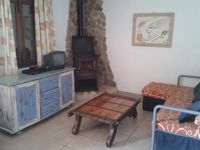 Property 45: Beautiful one bedroom eco cottage in the countryside with shared pool. I was staying in the apartment for 1 week with my wife and 2 kids. Generally my impression was very good. We were not expecting any extraordinary services while we wanted to spend a week &ldquo;away from it all&rdquo; to recharge the batteries &ndash; and this is exactly what we got. The apartment presented on the photos looks like that in reality. It&rsquo;s located in the fields what was quite exciting for the kids as they could see horses, cows etc. not moving away from the small garden in front of the building. The rooms were in a good condition and there was enough space for a family like us (4). Kitchen equipment was also good. The only issue in the apartment was the hot water that took us a while to figure out how to get it hot enough and with the right pressure. Getting to the beach or restaurants is quite a walk, but this perfectly meets the &ldquo;no hurry&rdquo; atmosphere of El Palmar. The beach is excellent but I would advise everyone not only to visit the one in El Palmar but to go to some other beaches around as well. The booking process was smooth and with no problems same as the pickup done by the owner. He doesn&rsquo;t speak English so the communication was a bit challenging but with help of internet and online translators we managed that :) If we needed anything the owner was around and very helpful. I would recommend staying in the apartment. It&rsquo;s worth the money you pay. We brought home great memories about the apartment, El Palmar and the whole area. Definitely would like to come back once in the future.